AP / TS Teachers Working Holidays Reservation of Leave - Mid-term / Summer Holidays for Enumeration Census : GO.35 Dt.16/01/1981, Drafting of Teachers during Holidays for Enumeration Census etc. Reservation of Leave Orders as per GO 35 Dt. 16-01-1981. They are eligible for reservation of proportionate leave to the extent they are prevented from utilizing the summer vacation. Earn leave GO on holidays Teachers Earn leave GO in AP Education-Drafting of Teachers during Holidays for Enumeration Census etc.,-Reservation of Leave-Orders issued. EDUCATION (H) DEPARTMENT G.O.Ms.No35 Dt. 16-01-1981. 1. 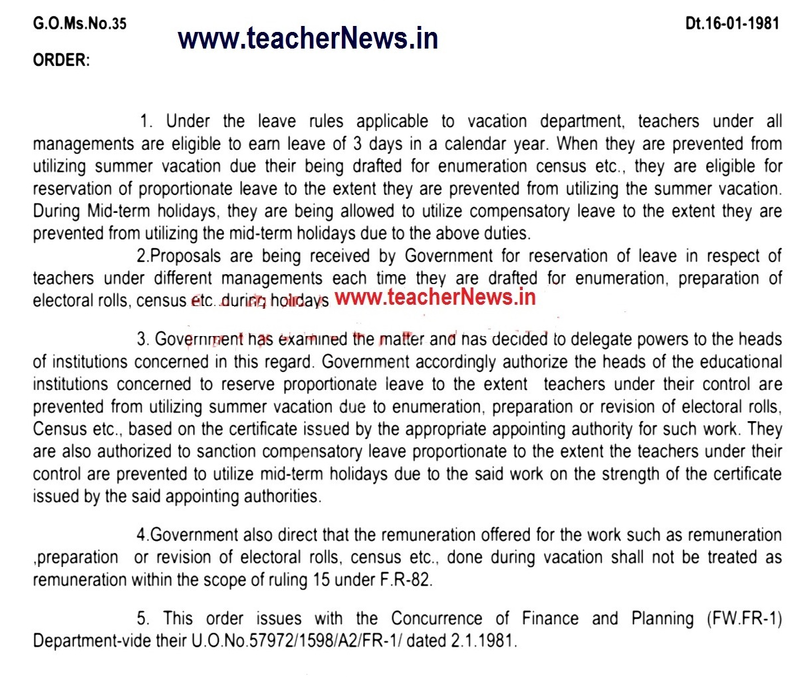 Under the leave rules applicable to vacation department, teachers under all managements are eligible to earn leave of 3 days in a calendar year. When they are prevented from utilizing summer vacation due their being drafted for enumeration census etc. they are eligible for reservation of proportionate leave to the extent they are prevented from utilizing the summer vacation. During Mid-term holidays, they are being allowed to utilize compensatory leave to the extent they are prevented from utilizing the mid-term holidays due to the above duties. 2. Proposals are being received by Government for reservation of leave in respect of teachers under different managements each time they are drafted for enumeration, preparation of electoral rolls. census etc., during holidays. 3 Government has examined the matter and has decided to delegate powers to the heads of institutions concerned in this regard. Government accordingly authorize the heads of the educational institutions concerned to reserve proportionate leave to the extent teachers under their control are prevented from utilizing summer vacation due to enumeration, preparation or revision of electoral rolls, Census etc.. based on the certificate issued by the appropriate appointing authority for such work. They are also authorized to sanction compensatory leave proportionate to the extent the teachers under their control are prevented to utilize mid-term holidays due to the said work on the strength of the certificate issued by the said appointing authorities. 4. Government also direct that the remuneration offered for the work such as remuneration preparation or revision of electoral rolls census etc. done during vacation shall not be treated as remuneration within the scope of ruling 15 under F.R-82. 5. This order issues with the Concurrence of Finance and Planning (FWtFR-1) Department-vide their U,0lNo.57972/1598/A2/FR-1/ dated 2.11981. 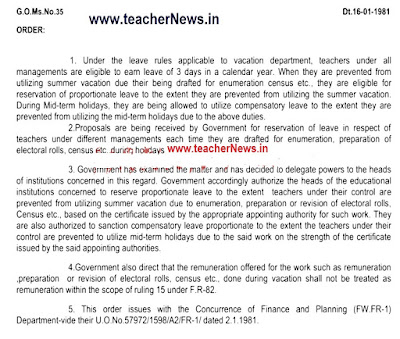 GO 35 Teachers Working Holidays Reservation of Leave - Mid-term / Summer Holidays for Enumeration Census as per FR 82.